One of the best ways to save money on a holiday is to eat in at your accommodation for at least a few meals during a holiday. It can be as simple as bringing along pre-made muffins or other baked goods to nosh on for breakfast each day. One of the advantages of camping is utilising the facilities at either the holiday park or in your caravan to be able to serve up some great camping food. This not only saves you money, but also allows you to easily cater to the tastes of everyone in your family or group. However, it’s not possible to bring your entire pantry and fridge contents with you on a holiday so that leaves you with the decision of what to bring from home or make ahead, and what to buy locally. We’d suggest a visit to local farmers markets and food stores to secure such things as produce and other perishables (milk, butter, etc.). Bring canned goods and perhaps a few meal starters with you from home. Check out any of these locations for a great selection of Byron Bay food to make meals, provide snacks or finish out the ingredients you’ve brought from home. The Byron Farmers Market, which takes place every Thursday from 8 to 11 am at the Butler Street reserve, offers visitors a chance to buy all kinds of fresh fruit and vegetables, free-range eggs, fresh meat and organic coffee. This Byron Bay market even features locally made wine! You can stop by the Nomadic Kitchen stall to buy food that was made using the Byron Farmers Market produce. If you miss the Thursday market, the Bangalow Farmers Market, which is associated with the Byron market, is on Saturdays from 8 to 11 am. It is held behind the Bangalow Hotel. This Byron Bay shop features organic, natural and GM-free food and is located in the city centre on Jonson Street, across from Woolworth’s. The location makes it easy to stop by the store to pick up organic food in Byron Bay while out checking out the sights of Byron Bay. Santos also features an online ordering tool, so if you happen to discover something you love when you visit, then you can have it sent home (provided you live in Australia) to remind you of your Byron Bay holiday. Located on 80 acres outside of Byron Bay proper, The Farm, an actual working farm, brings together growers who want to provide sustainable, 100 percent chemical- and spray-free food. Taking a trip here gives you access to several microbusinesses within one area where you can obtain fresh eggs, fruit, vegetables and breads and pastries. Both the Produce Store and Bread Social are open seven days a week from 7 am to 4 pm. Make note that you should get there early for fresh baked bread as it tends to sell out quickly! Keep in mind, you might want to plan one of your meals out around your visit so you can try out Three Blue Ducks on The Farm, an on-site restaurant that is getting rave reviews. The menu changes with the seasons and what the owners/chefs can find locally or on the farm. Open seven days a week, Fundies Wholefood Market & Café features organic produce, grains, flour, nuts and much more. The market is located in the heart of Byron Bay and is open seven days a week. This might be a good option to hit up if you find yourself running out of anything you brought from home and to pick up more produce for the rest of your holiday. As a bonus, there’s a café in the store that serves fresh salads and vegetarian dishes as well as coffee, juices and smoothies. 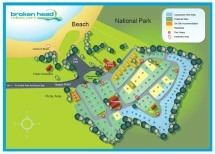 With excellent BBQ and camp kitchen facilities, Broken Head Holiday Park provides the perfect place to stay while on your Byron Bay camping holiday. Keep your travel budget from going over by making yummy camping food at your Broken Head campsite using some of the amazing local produce you’ll find at any of the above listed Byron Bay markets. But be sure to leave some room in your budget to go out and experience some of the amazing array of restaurants in the Byron Bay area as well.